For me Halloween does not bring to mind scary spooky images. Coming home with a huge bag of candy and spreading it out all over the floor. Picking out the good stuff for myself. My mom carefully reviewing my choices. Candy to go with lunch at school the next day. Those are the thoughts that come to mind when I think of Halloween. So how does all this tie in with Romance and my writing? Well both of my stories have a nostalgic element. In Always a Bride, Alex runs into her high school sweetheart and longs for those less complicated days. In Dog Day Afternoons, Jessica is grieving when her dog drags her in to an encounter with her childhood idol and she rethinks her childhood fantasies. If either of these stories sounds interesting to you I’ll be giving one lucky reader their choice of Something Borrowed (featuring Always a Bride) or Unleashed Hearts (with Dog Day Afternoons) Just leave a comment with your e-mail address and just for fun tell me what your favorite candy was when you went trick-or-treating. I believe Halloween does evoke happy memories for most people. It is a time of great excitement and anticipation. Carolyn my friend, thanks for coming by. It was such an exciting time as a child. Have a wonderful day. 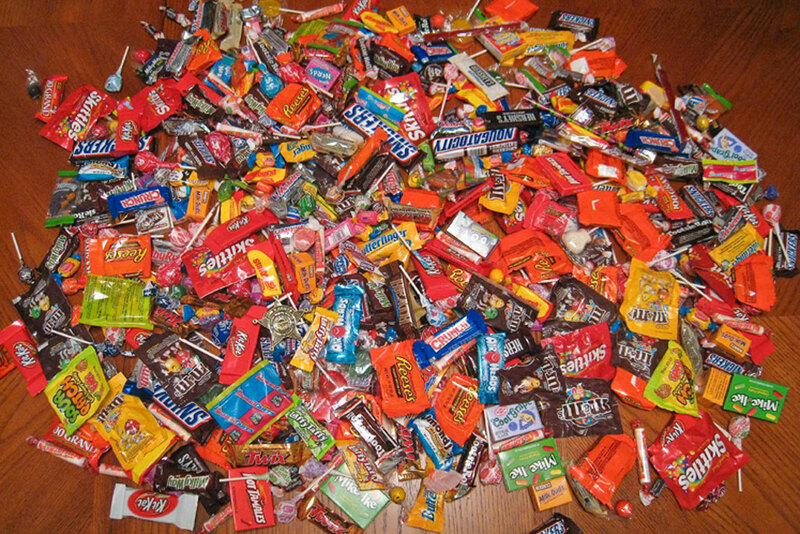 That is some pile of candy! Reminds me of the stash I had after trick or treating in Minneapolis. My all time favorite candy to get is Reeses Peanut Butter Cups. Whoppers are pretty good too. Ummm Peanut Butter Cups, they are probably my favorite. Thanks for visiting. Have a great day. Those are all very familiar memories and I must say, that big pile of candy certainly brings back thoughts of happy times. Besides Christmas, I think Halloween is the next most exciting thing for children. Thanks for dropping by Maggie. Those were definitely happy times. I always loved the huge pile of candy. I feel the same way about Halloween! I hate scary stuff so the holiday doesn’t have much appeal to me now. I did, however, dress up as a witch for numerous Halloweens when I was a kid… 🙂 What candy did I always love getting? Hmm…I can’t really remember, but I have a feeling it could have been Crunchie…mmm…delish. Ahhhh, I loved the excitement of dressing up and it kept on going when I had children! Lovely post! Thanks for visiting Em. I think I had almost as much fun with my son as I did on my own too. My favorite part was dressing up. Mom had an old sea chest in the cedar closet we weren’t allowed to touch until a week before Halloween, but from then on until the 31st all bets were off as my sibs and I rummaged through the pile of costumes. Of course, the Reese’s Cups weren’t bad either. That’s got to be a toss up between Three Musketeers, Bottle Caps, or Runts. Mmmmmmm. I try to avoid all three these days. Too yummy for my growing tummy! Jennifer, thanks for visiting. Yummy candy too. Oh! And Reeces cups, but they have to be REALLY fresh. They dry out quickly. I like ’em nice and moist! I do like scary but Halloween itself makes me think of the fun stuff and candy. Thanks so much for visiting.